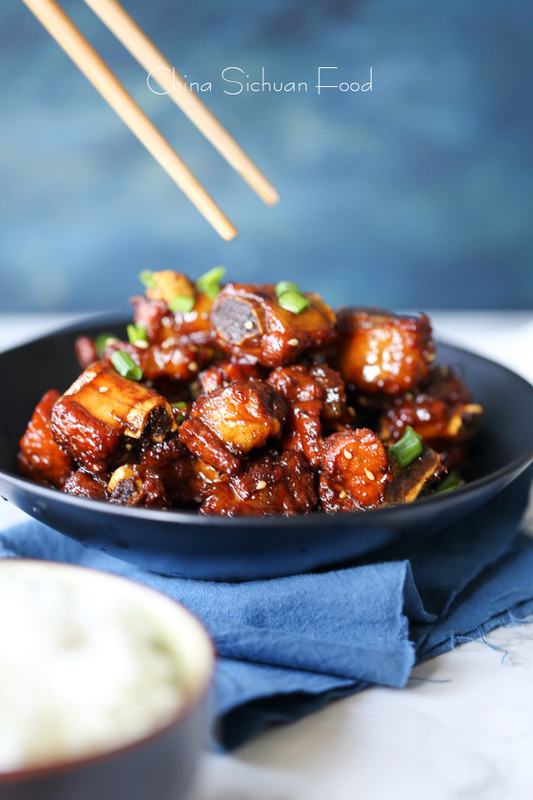 Sweet and Sour Rib (Tang Cu Pai Gu)is a quite popular dish in China. 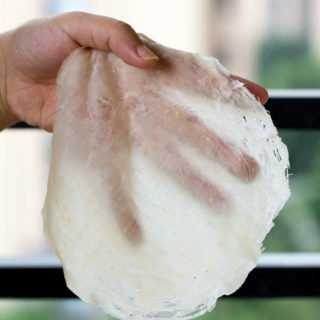 However, mostly people will eat it in restaurant rather than at home since restaurant version is quite hard to achieve at home. This is Elaine’s simplified homemade version without deep-frying. First published 2014 and updated in Nov, 2015 with a video. Restrictively, spare ribs are selected as the main ingredients. The popularity is not only due to its delicious taste but also its beautiful color. 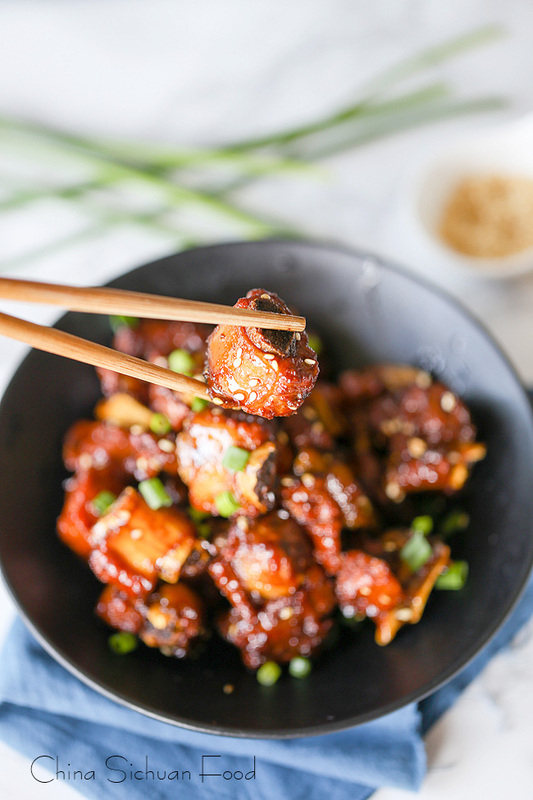 For restaurant style sweet and sour ribs, spare ribs are firstly marinated and then deep-fried in hot oil for less than 1 minute. This step creates a crispy surface and a tender inner part, at the same time, ribs are almost cooked. After stir frying the sugar color, other ingredients are well combined. At the last step, ribs are placed in the sauce for coating. Usually we do not have such strong fire at home and deep-frying process requires a large amount of oil. In this home version, we simmer the ribs along with the sauce and then thicken the sauce at the last stage. The texture is slightly different from restaurant version but quite comforting. Sweet and sour is a popular taste in many Chinese cuisine and it can be achieved by different ingredients. For example, in well known Chinese sweet and sour sauce, ketchup is used. However for this recipe, we use black vinegar, soy sauce and sugar color (dark red rock sugar color) to create the bright red color. Sugar color (糖色) is melted sugar with oil, usually presenting a red dark color. 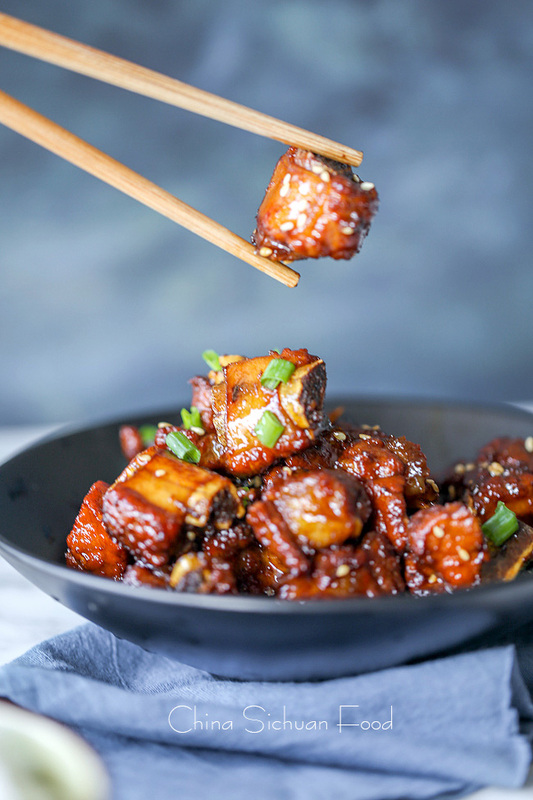 This cooking method is also used in many other dishes like this red braised pork belly. Comparing with the color bought by light soy sauce or ketchup, sugar color has stronger viscidity. Besides, I high recommend cutting the spare ribs into small sections around 1 inch so they can be flavored. 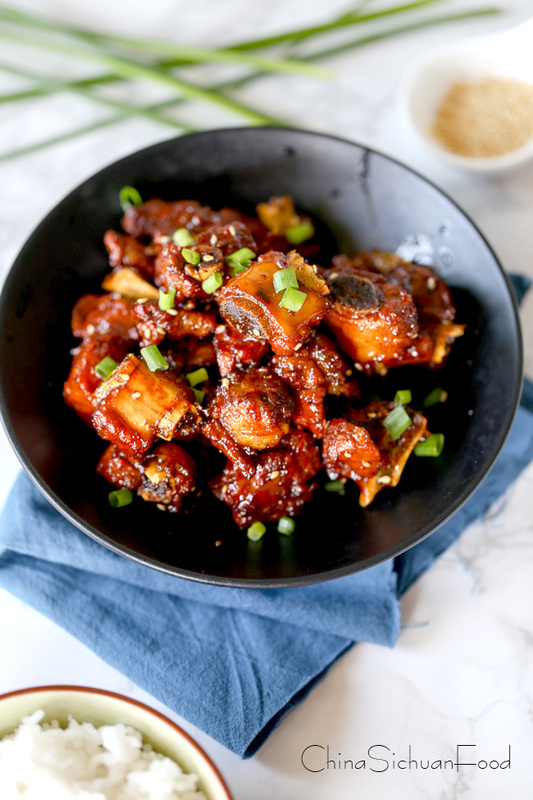 Chinese Sweet and Sour Ribs have an excellent taste. This version is an simplied one that can be made at home easily. Cut ribs into 1 inch to 1.5 inch sections. Place in a pot with cold water. Bring to boil and continue cooking for 2-3 minutes. Transfer out and rinse under running warm water. Set aside to drain. Add cooking oil and smashed rock sugar in wok, heat over slow fire. Keep stirring until the sugar melts and turns into dark red. Add ribs to coat the sugar color, place light soy sauce, cooking wine and black vinegar. Continue stir fry for 2 minutes and pour enough hot water to cover and add ginger, green onion and star anise. Cover the lid and simmer for 25 minutes over slowest fire. Stir once or twice in the process. Pick the ginger, green onion and star anise out in the later stage. Turn up the fire and thicken the fire. Keep stirring and stop when the sauce is almost adhered to the ribs. Be carefully in the last minutes, do not get your ribs overcooked. Add extra 1 teaspoon of black vinegar and sesame seeds. Combine well. Garnish chopped spring onions before serving. When stir frying the sugar color, use slowest fire and keep stirring. Remove the work from fire if the temperature is too hot. The ribs should be drained completely before adding to the wok, otherwise the sugar color might splash out. Sorry I spoil the pictures because I was only given two minutes. And my eaters carve them up in 5 minutes. Nice recipe and pictures and looks really good! I have not made this dish at home in a long time. Thnaks for sharing! Thanks for visiting and commenting. This is not a usual dish for me too. But honestly I love it. Half rice bowl of chicken stock or other stock. You can also use water instead. This looks AWESOME! Do you think it will work with pork belly? Also, just to clarify, in the post you talk about deep frying until crispy but in the recipe there is only a bit of oil used so is it just supposed to be pan fried? Or deep fried? Thank you! Both deep frying and pan frying are ok. 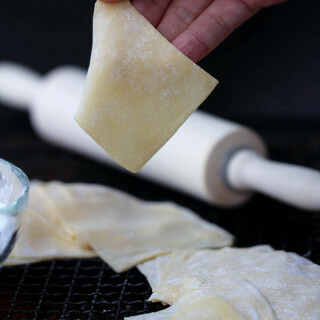 Deep frying is quicker but pan-fried with less oil is healthier. The sauce might go well with pork belly. However fatter pork belly might be greasy. I still need experiment to figure that out. Sorry, another question! When do you add the stock/water?? Stock should be added in step 4 before you turn up the fire to thicken the sauce. Hi.. this recipe is very helpful and my boss like it..
Hi i see in your recipe the vinegar but i didnt see which step you add the vinegar. Please reply. The recipe is updated. Thanks for bringing that to my attention. You are the most welcome. Macaque. Happy cooking! When do I add the ginger, green onion, and star anise? Sorry I miss that out. I add ginger, green onion and star anise after pouring the water to simmer. This is my daughter’s favorite dish to order! I have to save this recipe and try making it next time. Looks so good! This looks delicious…curious, will the meat be “Fall off the bone”? Is rock sugar similar to Palm sugar? 25 minutes simmer will not make the meat “fall off the bone”. We like this dish to be slightly tender and chewy. If you love to have it fall off the bone, use high pressure cooker for simmering process. Good job Elaine, can one use chicken cubes in batter or minced meat balls for this recipe too? Also, didn’t see ketchup or pineapple in this recipe,is sugar their replacement? This sweet and sour ribs does not require ketchup. There are so many ways to achieve sweet and sour taste. For this recipe, ribs are highly recommended. 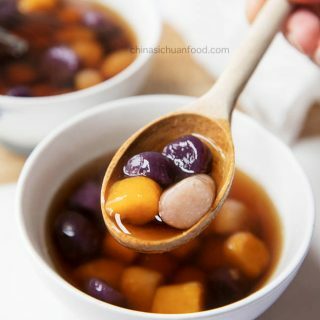 But you can use meat balls with this sweet and sour sauce with ketchup: https://chinasichuanfood.com/chinese-sweet-and-sour-sauce/. 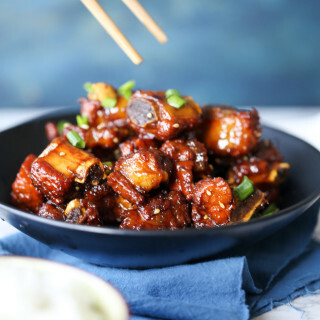 For chicken cubes in batter, I recommend this recipe https://chinasichuanfood.com/sweet-and-sour-pork-with-pineapple/ with pineapple cubes too. Hope this helps. I only have sweet black vinegar… How do I use it in this recipe? 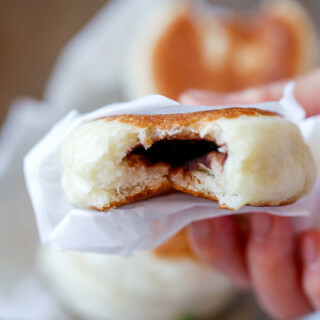 Sweet black vinegar can work for this recipe. Hi, I want to make this recipe but I only have sweet black vinegar. How can I use it in this dish or is there a substitute for black vinegar? What is the difference between black and extra black vinegar. Can you give a sample brand name for each, thanks. 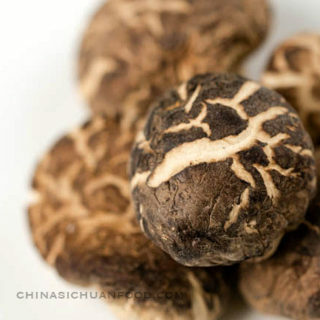 Is the black vinegar same as ChinKiang Venigar? ChinKiang Vinegar is one famous type of Chinese black vinegar. Extra black vinegar usually is aged black vinegar. Extra black vinegar usually is produced by Shanxi province. Good morning Elaine. I am looking forward to making this recipe and will give you feedback. Thanks for the efforts you have made with explanations. 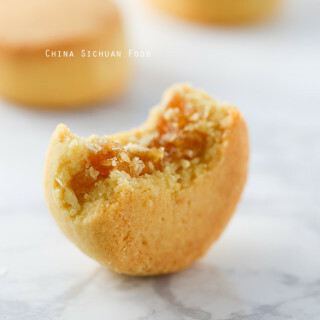 I have uploaded most of my tested recipe on this little blog, so I believe it should be one of the best resources for you to learn Chinese cooking. If you have any question, you can leave me a comment. lovley recepie fantastic flavor 🙂 …. to give some chrispiness to the ribs my husban usualy steams or cooks the ribs and than he puts them into hot frying pan with little oil and browns little the outer layer than he adds the almost ready souce thats how he brings it all together. Can you add spicy chili to this to give the flavor some heat? Chili oil is not recommended. It breaks the balance of sweet and sour sauce. Awesome recipe. 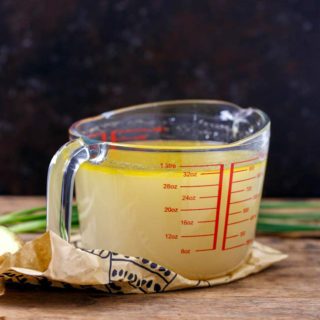 How do you use it with instant pot? You can fry the ribs firstly and then add all the sauces. Transfer to instant pot and cook a rib or meat procedure. When it is finished, open the lid and re-heat until the sauce is well thickened. I tried your recipe a couple of times and had a hard time dissolving the rock sugar in the wok under slow fire, both times the sugar turned light brown and hardened(crystallized). Do you have any suggestions/critics? Appreciate any pointers that you may have. If that happens, I would suggest you adding a small cup of warm water when the sugar turned light brown. Or another potion is when the sugar dissolve mostly, turn off the fire and return it when after adding the hot water. Thank you for sharing this recipe! The version I learned requires deep frying and then a quick stir-fry in the sauce. As such, I cook this dish only once a year! 😀 I’m excited to have found this site and to try this recipe! I’m also going to try your Chong Qing Ma La chicken on my father! He loves Sichuan food. Thank you for sharing this recipe. Looks simple and mouth-watering dish. I use to cook ribs in high pressure cooker to get it tender. In this recipe you only slow cook for about 25-30 minutes. Will the ribs get tender at that quick time? Sure, Sani. High pressure cooker can make the process even easier. I cooked this today and it’s a hit. Thank you so much for sharing the recipe. I didn’t use star anise and the extra black vinegar. I just use the Chinkiang vinegar. Tasted really yummy. Thanks Ling. I am so glad to know your love my favorite dish. Love the site, but you never say how big the serving size is. It’s the whole thing 457 calories? It serves 3 and 457 calories is for each serving.